Viewing time: 5 mins. 46 secs. The Write Question is a weekly video podcast all about writing. 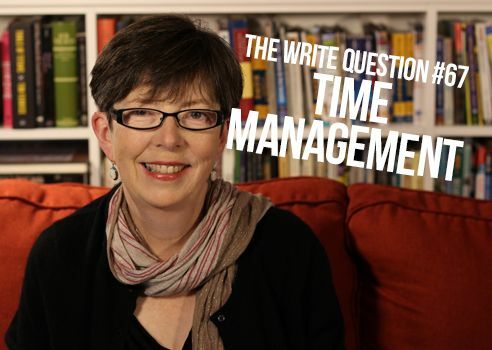 Today’s question focuses on how to deal with writers’ time management. If you have a question you’d like me to answer you can email me at daphne@publicationcoach.com, tweet me @pubcoach, or leave a message for me at the Skype account, The Write Question. Welcome to The Write Question, I’m Daphne Gray-Grant and my topic is time management for writers. Today, I have a question from Elizabeth Campbell, a Canadian, currently living in France. Here’s what she’s asked. Thanks for your excellent question, Elizabeth. Let me make a couple of important points right at the top. I am a professional writer and editor, so in addition to my own work — my blog and my current book — I also do work for other people. This means that I spend a great deal more of my day writing and editing than the average person needs to. My routine is that I try to do the most important tasks in the morning, when I have the most energy. I use the word ‘important,’ in the same sense that Stephen Covey does. [See link below.] Then, I tried to do my urgent tasks in the afternoon. I have less energy than but the urgency of the task helps focus my mind. It sounds as though you want some rules, so let me suggest this: if you are working on the book, I don’t think you should spend more than 30 minutes a day on it, while you are writing. Also, it’s okay to spend less. Anywhere from 5 minutes to 15 minutes until you get the habit established. Once you get to the editing phase, you could increase that to 60 minutes a day, but no more. Part of the reason I’m so mindful about not over-taxing writers, is that I want them to be able to sustain themselves for the length of time it’s going to take to produce a book. For most people, this is a bare minimum of a year. And for many, it can take two, three, or more years to finish. Think of yourself as the marathon runner of writers. If you don’t pace yourself and conserve enough energy for the long haul, you’re going to burn out. People sometimes say to me, “I can’t possibly write enough words for a book in 30 minutes.” But think about that statement. If you can write 200 words during that time, working only five days a week, you should be able to produce 52,000 words in the year. That’s awfully close to the length of a full book. Writing a book is not about making large, heroic efforts. Instead, it’s all about diligent daily efforts that add up to something significant, over time. While it’s true that researching, reflecting, creating models, and asking questions can sometimes be a distraction, I find that these tasks are all a necessary part of the writing process. Just be sure you also allow enough time for actual writing every day. For myself, I always try to write first thing in the morning — I usually set aside 30 minutes for my own writing. If I need to do researching etc., I save that part of the job for the afternoons, when I might — or might not — have the time. For me, my number one priority is to protect my writing time. Keep in mind that when you do a task is at least as important as how much time you devote to it. This is because we are all wired to be more productive at certain times of day. I was born a night owl but now I’m a morning lark so mornings work best for me. But note that mornings work best for many people because we tend to have fewer other obligations at that time of day. Also, most of us have more sticktoitiveness in the morning, even if we’re night owls by nature. Whatever your decision, pick a time of day and track your results. If you’re not achieving what you want, then try a different time and see if it works better for you. A big part of writing success is associated with understanding your own habits and harnessing them to work in your favour. Thanks for the question, Elizabeth. Your writing is just like a garden. It needs daily care and attention. Don’t give it too much water at once – you’ll only cause the plants to drown. Instead, do a little bit every day and, over time, your garden will grow into something that’s truly impressive.